Avshalom Caspi and his wife Terrie Moffitt, have just won the Klaus J. Jacobs Research Prize for their research research on mental health and human development. 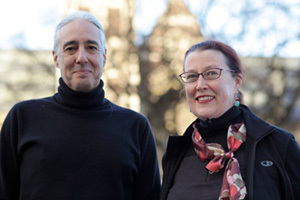 APS Fellow and Charter Member Avshalom Caspi and his wife Terrie Moffitt, also an APS Fellow and Member, hold professorships at two institutions: Duke University in Durham, North Carolina, and King’s College London. The pair, who research mental health and human development have just won the Klaus J. Jacobs Research Prize, given to individuals from all disciplines who make outstanding scientific contributions to improvement of young people’s development and perspectives worldwide. The prize includes 1 million Swiss francs to further the couple’s research. The Jacobs Foundation considers it vital to ensure that scientific findings from interdisciplinary research are incorporated in practice, giving out two awards annually — the Klaus J. Jacobs Research Prize, and the Klaus J. Jacobs Best Practice Award. With their groundbreaking study on the interaction between genetic disposition and environmental influences, Caspi and Moffitt have shown that possibilities for positive development always exist. Their research measures human growth and development from childhood through adulthood, showing that it is not just genes or environment that shape a person, but rather the interactions between the two. The award ceremony for the Klaus J. Jacobs Research Prize and the Best Practice Award takes place at the University of Zürich on 3 December 2010.